Connect with friends and the world around you on the Downtown San Diego Locals network. 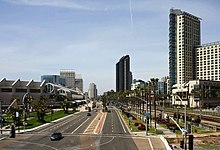 Downtown San Diego is the city center of San Diego, California, the eighth largest city in the United States. In 2010, the Centre City area had a population of more than 28,000. Downtown San Diego serves as the cultural and financial center and central business district of San Diego, with more than 4,000 businesses and nine districts. The downtown area is the home of the San Diego Symphony and the San Diego Opera as well as multiple theaters and several museums. The San Diego Convention Center and Petco Park, home of the San Diego Padres, are also located downtown. Downtown San Diego houses the major local headquarters of the city, county, state, and federal governments. The city of San Diego was originally focused on Old Town near the Presidio, several miles north of current Downtown. The location was not ideal because it was several miles from navigable water. In 1849 Lt. Andrew B. Gray, a surveyor working with the boundary commission to establish the boundaries of the new state of California, suggested that an area closer to San Diego Bay would be a better location for a city because it would be better for trade. He proposed the idea to William Heath Davis, who recruited four other investors. The partners under Davis's leadership purchased 160 acres (65 ha) of land in what is now Downtown San Diego. They laid out a street plan for New Town and built a wharf and warehouse. Several people built houses there, including the still-standing William Heath Davis House, now a museum. John Judson Ames wrote a prospectus for a newspaper, the San Diego Herald in December 1850, soliciting advertisements and subscriptions from the towns-people; the first issue was published on May 29, 1851. However, New Town did not do well due to a lack of fresh water, a financial depression in 1851, and opposition from the established settlements in Old Town and La Playa. In 1867, Alonzo Horton purchased 800 acres (320 ha) of pueblo lands in the current Downtown area, and in 1869 he added Davis’s 160 acres (65 ha) to his holdings; the area was referred to as the Horton Addition. Davis’s wharf had fallen to pieces by then, but Horton realized the area was still ideal for a harbor. He built a new wharf at the end of Fifth Avenue in 1869. He vigorously sold property and gave away land to promote development of the area, fueling the first of San Diego’s many real estate speculation booms. People flocked to the area, known as New Town, because of its better access to shipping. In 1871 government records were moved to a new county courthouse in New Town. By the 1880s New Town had totally eclipsed Old Town (as it is called to this day) as the heart of the growing city. In 1885 the transcontinental railroad reached San Diego. 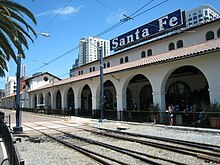 The Santa Fe railway station opened downtown in 1887 (that station was replaced in 1915 by the Downtown landmark Santa Fe Depot, which is still in use). In 1886 the city’s first electric lights and first streetcars were established in New Town. In 1912 the Spreckels Theater opened downtown, the first modern commercial playhouse west of the Mississippi. A new commercial pier, the Broadway Pier, was built by the city in 1913. 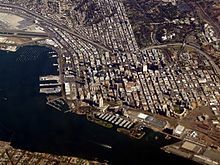 In the 1910s, Downtown became one of the many San Diego neighborhoods connected by the Class 1 streetcars and an extensive San Diego public transit system that was spurred by the Panama-California Exposition of 1915 and built by John D. Spreckels. These streetcars became a fixture of the neighborhood until their retirement in 1939. In 1964 the multi-story City Hall and Community Concourse were dedicated on a four-block-square property at 202 C Street. Recent mayors and city councils have discussed building a replacement city hall, but no replacement plan has been approved. In the 1960s, Centre City began to fall into a state of disrepair and disrepute. Major businesses and stores moved from downtown to suburban shopping malls. Downtown became known as a hangout for homeless people and sailors on liberty. Tattoo parlors, bars, and strip clubs were predominant forms of business. Trash littered the Gaslamp Quarter, many 19th century Victorian houses were rundown, and there were few buildings of significant size (the tallest building at the time was fourteen stories, the locally famous El Cortez). Despite this, low- and mid-rise buildings were beginning construction. In 1975, redevelopment plans were created for Downtown. In 1985, Downtown underwent more redevelopment with the completion of Horton Plaza, the Gaslamp Quarter revival, and the completion of the San Diego Convention Center. Petco Park, a baseball ballpark used by the San Diego Padres, opened in 2004. In the 1860s, the first Chinese moved to Downtown. In the 1870s, the Chinese were the primary fishermen in the area. Beginning in the 1880s, a large number of Chinese began to move to San Diego, establishing a concentration; with up to 200 Chinese making up a minority of the 8,600 who lived in all of San Diego. At its peak, about a thousand Chinese lived in San Diego and were faced with discrimination. 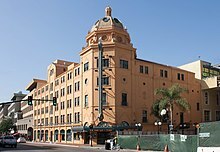 The concentration became known as Chinatown, and an effort to demolish the area due to the Panama-California Exposition was attempted but the area continued on until World War II. Beginning in the early 1900s, Filipinos began to move to San Diego, and settled in and near Chinatown. In 1995, the Asian Pacific Thematic Historic District, was created to preserve the remaining structures that remained from the era when Chinatown existed. While a few of the buildings remain, there no longer exist a significant concentration of Chinese Americans in the former neighborhood. Columbia, the west district of downtown. Located between the Marina and Little Italy, west of Columbia Street. Core District, the central business district of downtown. Cortez Hill, the northeast district of downtown. East Village, the east district of downtown, which is home to Petco Park and the surrounding Ballpark Village. Little Italy, the northwest district of downtown. Marina, the southwest district of downtown, which is home to Seaport Village and Pantoja Park. Horton District, the district comprising Horton Plaza and adjacent buildings in central downtown. Seaport Village, a tourist district within the Marina District, which is not an official district or neighborhood. Due to San Diego International Airport (Lindbergh Field)'s proximity to downtown, there is a FAA imposed 500-foot height restriction on all buildings within a 1.5-mile radius of the runway. The height regulation exists because when planes approach the airport, any structure taller than 500 feet within the radius could interfere with flight operations and potentially result in a collision. The United States Postal Service operates the downtown San Diego Post Office at 815 E Street. The city's former main public library is located across the street from it at 8th and E streets, but currently is vacant. A new nine-story Central Library opened in 2013 on Park Boulevard at J Street. 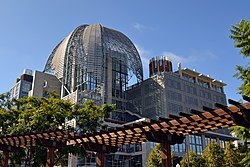 Other government buildings downtown include City Hall and other city administration buildings, the San Diego Police Headquarters at 14th and Broadway, the State of California office building at 1350 Front Street, and a three-block federal office complex at 8th and Front streets. County and federal courthouses are also located downtown. The San Diego Convention Center and Petco Park are located downtown. More than 200 cruise ships a year call at the cruise ship terminal. A passenger ferry connects downtown San Diego with Coronado, and San Diego Bay harbor tours depart from Harbor Drive. Downtown events include the Big Bay Balloon Parade, held in conjunction with the Holiday Bowl; the Martin Luther King Jr. Day Parade and Festival; the Parade of Lights featuring holiday-decorated boats on the Bay; and the San Diego Street Scene music festival. Every mid to late July, downtown San Diego is transformed for San Diego Comic Con, the largest entertainment and comic book convention in the world. San Diego Comic Con is held inside the San Diego Convention Center, but the convention has expanded to other nearby hotels, parks, and plazas which include the Manchester Grand Hyatt Hotel, San Diego Marriott Marquis & Marina, Hilton San Diego Bayfront, Omni San Diego Hotel and Gaslamp Quarter, San Diego as major supporting venues. The downtown area is served by the San Diego City Schools. Washington Elementary School is located in the downtown area. San Diego High School and San Diego City College are located in the northeastern corner of downtown adjacent to Balboa Park. Middle school students from downtown attend Roosevelt Middle School in the Balboa Park area. The charter high school e3 Civic High School is located inside the downtown library. The Monarch School, a public K-12 school for students who are homeless or affected by homelessness, is also located downtown. Streets are laid out in a grid pattern and many are designated for one-way traffic. North–south roads have both names and numbers. The named roads begin with Harbor Boulevard then move east past Pacific, Kettner, India, Columbia, State, Union and Front streets. The roads then numbered and are called avenues, starting at 1st Avenue and continuing to Park Boulevard (12th Avenue). The general pattern is that even numbered streets head south, and odd numbered streets go north. East–west streets are laid out alphabetically from A to K, with the exception of D, H and I, which are replaced with Broadway, Market and Island streets respectively. Streets north of A Street are named after trees and start with Ash Street, and going up to Laurel. Main thoroughfares include Broadway and Market streets (east–west), and Harbor Drive, Pacific Highway and Park Avenue (north–south). Three freeways either pass through or start/end in downtown San Diego. State Route 163 (SR 163) ends in downtown with the southbound lane of the freeway becoming 10th Avenue and 11th Avenue becoming the northbound lane at Ash Street. Interstate 5 (I-5) passes above the downtown area and is accessible from selected streets outside of the actual downtown area or at the intersection of 10th/11th and Ash (where 163 starts and ends). Additionally, SR 94 enters downtown from the east, with westbound SR 94 becoming F Street and G street becoming eastbound SR 94. The downtown area is served by the San Diego Metropolitan Transit System, the San Diego Trolley. There is also a commuter train linking downtown with northern San Diego County, called the Coaster, which also stops at communities along the San Diego County costaline, as well as the Amtrak passenger rail system. Parking is mainly concentrated in various "pay to park" lots, with metered parking spaces alongside most streets. There is also parking available at the County operation center (located between Harbor Drive and Pacific Highway, just north of Ash), as well as Horton Plaza and Seaport Village shopping areas. ^ "Downtown San Diego". downtownsandiego.org. Downtown San Diego Partnership. Retrieved 23 April 2015. ^ "Early Journalism in San Diego The San Diego Herald and The San Diego Union". San Diego History Center. Retrieved 3 August 2014. ^ "John Judson Ames (1821 - 1861)". San Diego History Center. Retrieved 3 August 2014. ^ Hurley, Morgan M. (June 8, 2012). "Restored historic streetcar showcased at Trolley Barn Park". San Diego Uptown News. Archived from the original on June 19, 2014. Retrieved June 18, 2014. ^ History of the City of San Diego Archived October 25, 2007, at the Wayback Machine. San Diego Government. Retrieved on 2007-10-14. ^ Hacker, Steven (2005). "The Rhetoric Versus the Facts: What the Brookings Report Fails to Reveal" (PDF). International Association for Exhibition Management. Archived from the original (PDF) on 15 March 2016. Retrieved 21 February 2015. ^ Stouse, Amanda (11 June 2009). "Asian historic district set to get a makeover". San Diego Union-Tribune. Retrieved 24 May 2018. ^ Saito, Leland (Winter 2003). Hennessey, Gregg, ed. Reclamation and Preservation (Report). San Diego Historical Society. Retrieved 24 May 2018. ^ Chu, Amy (8 April 1982). "The Climb to Gold Mountain: San Diego's Chinatown". San Diego Reader. Retrieved 24 May 2018. ^ Bay, Carlos (6 February 1975). "Chinatown". San Diego Reader. Retrieved 24 May 2018. ^ Dotinga, Randy (8 July 2010). "A Closer Look at S.D. 's Chinatown". Voice of San Diego. Retrieved 24 May 2018. ^ Guevarra Jr., Rudy P. (Winter 2008). ""Skid Row": Filipinos, Race and the Social Construction of Space in San Diego" (PDF). The Journal of San Diego History. 54 (1): 26–38. Retrieved 22 May 2018. ^ Centre City Development Corporation (March 2006). Final Environmental Impact Report (PDF) (Report). Retrieved 24 May 2018. ^ Wong, Cliff (2 October 2015). "Exploring San Diego's forgotten Chinatown". Sampan. Boston: Asian American Civic Association. Retrieved 24 May 2018. ^ Shaw, Gary. "Not Sprawling To Ramona Archived October 10, 2007, at the Wayback Machine". San Diego Metropolitan (October 2003). Retrieved on 2007-10-13. ^ FAA Information about San Diego International Airport (SAN). Airport-data.com (2013-12-12). Retrieved on 2014-05-24. ^ "Post Office Location - DOWNTOWN SAN DIEGO Archived June 3, 2009, at the Wayback Machine." United States Postal Service. Retrieved on May 5, 2009. ^ "About MCASD". Museum of Contemporary Art San Diego. MCASD. Retrieved 23 April 2015.